Spavin is one of the most common causes of lameness in jumping horses. 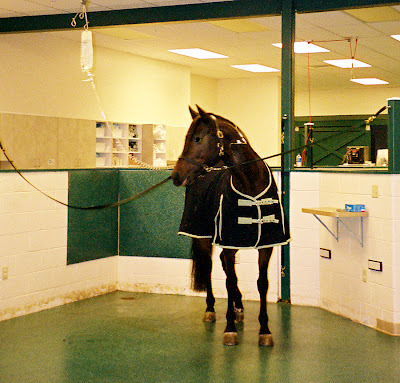 Newly published trials from a study in England show that horses suffering lameness caused by bone spavin can show marked improvement following treatment with a Tiludronate (Tildren) infusion, when administered in combination with controlled exercise. Bone spavin is the commonly used name for osteoarthritis of the distal (lower) hock joints. It is thought to be responsible for around a third of hind-limb lameness in horses and ponies in the United Kingdom, and is common in the United States, as well. 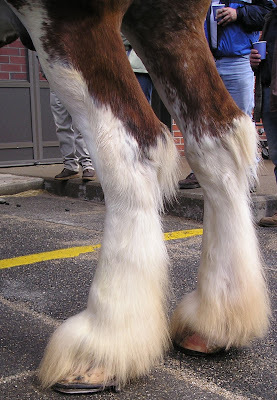 Spavin usually affects both legs at the same time and it can be seen in horses and ponies of all ages and types, although a horse that has a straight or what is called "sickle" hocks seems to have a greater risk of having spavin. Nothing illustrates a hock quite like a Clydesdale. Most people think of the hock as the point (calcaneus) that protrudes like a knob, but the majority of the bones in the joint susceptible to spavin lie below that point. The trials were carried out on a total of 108 pleasure horses, show jumpers and eventers of a variety of sizes and breeds, all of which had been clinically diagnosed with bone spavin. Eighty-seven horses completed the trials, comprising 42 Tiludronate treated horses and 45 placebo cases. By day 60, approximately 60 percent of the Tiludronate treated horses had improved in lameness by two grades or more, scored on a ten point system. A Morgan mare with her Tildren IV drip at New England Equine Medical Center in New Hampshire, one of the US clinics with provisional licenses to administer Tildren to horses. Tiludronate, marketed as Tildren by the French company Ceva, has been used to treat bone spavin successfully in Europe for several years. The treatment is designed to regulate and improve the bone remodeling occurring next to the arthritic joints, to slow down the degradation of the bone structures and to alleviate pain. In simple terms, bones remodel all the time but with osteoarthritic conditions such as bone spavin the bone-producing cells (oesteoblasts) can't keep up with the bone-removing cells (osteoclasts). Tiludronate is believed to actually help stop the osteoclasts from continuing to disrupt the bones within the joints. It prevents further damage and gives the osteoblasts a chance to catch up and repair the problem. In this way, Tildren works similarly to the way that some osteoporosis medications are believed to work on humans. Tildren is not currently widely available in the United States for use on horses. Some veterinary practices have provisional licenses to use it. Its most widely used application is probably on horses with foot pain, particular what is loosely referred to as "navicular pain". 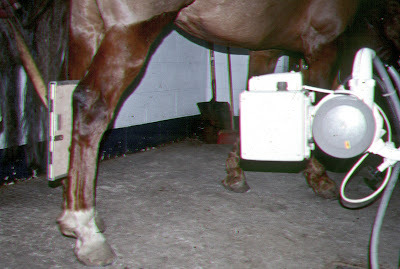 Some people see Tildren as having great promise for horses with pedal osteitis. The first clinical trials for Tildren were conducted by Professor Jean-Marie Denoix at the Ecole Nationale Veterinaire d'Alfort in Paris. In Australia, the University of Melbourne is researching the use of Tildren to treat shin soreness in racehorses. Professor Chris Whitton is conducting a clinical trial on two-year-old Thoroughbreds to see if Tildren can prevent the sore shins and lost training time so prevalent in that age group. The normal treatment for Tildren is an IV session at a hospital or clinic, followed by booster sessions at intervals. The study was funded by Ceva, manufacturers of Tildren. It is published in the Equine Veterinary Journal under the title Tiludronate infusion in the treatment of bone spavin: A double blind placebo-controlled trial by authors MR Gough, D Thibaud, and RKW Smith in the June 2010 edition, volume 42, Number 5, pages 381 - 387. 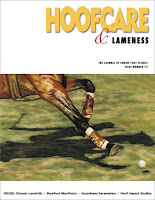 Hock Displacement: Lateral Extension Shoes to Support the Hind Limb in Sport Horses by Haydn Price in Hoofcare #78. © Fran Jurga and Hoofcare Publishing Fran Jurga's Hoof Blog is a between-issues news service for subscribers to Hoofcare and Lameness Journal. Please, no use without permission. You only need to ask. This blog may be read online at the blog page, checked via RSS feed, or received via a digest-type email (requires signup in box at top right of blog page). 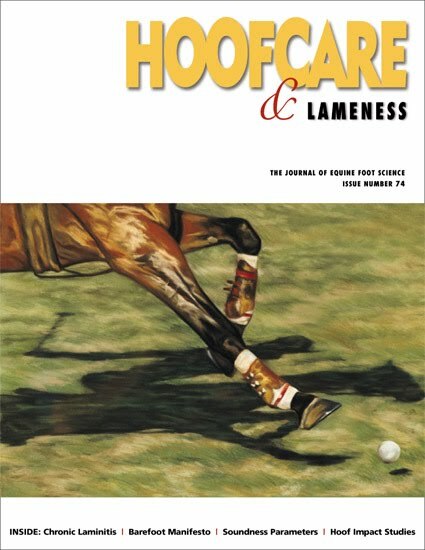 To subscribe to Hoofcare and Lameness (the journal), please visit the main site, www.hoofcare.com, where many educational products and media related to equine lameness and hoof science can be found. Questions or problems with this blog? Send email to blog@hoofcare.com. Is This What They Mean by "Loads Well"?